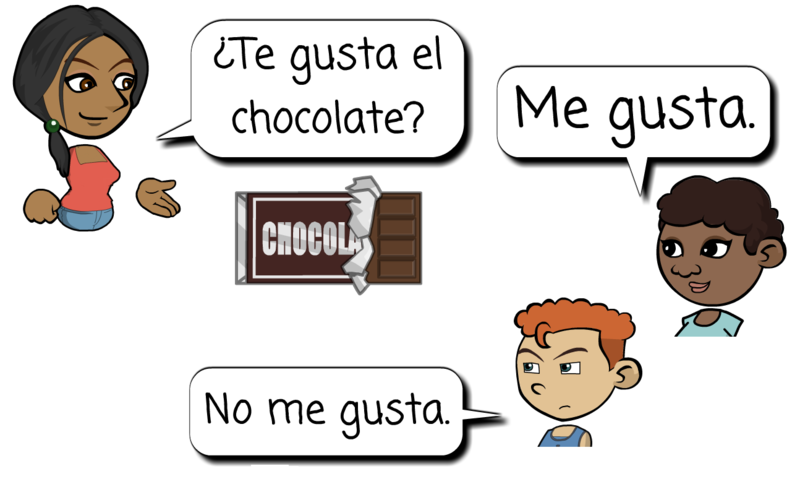 To say you like something in Spanish, you say it appeals to me - me gusta. The words me gusta literally mean it appeals to me. You don't see the word "it" because the subject pronoun "it" doesn't exist in Spanish. I like to spend time with friends. Me gusta pasar tiempo con amigos. I like to watch TV. Me gusta ver tele. I like the show Spongebob. Me gusta el programa Spongebob. I like to go out to eat. Me gusta salir a comer. I like to listen to music. Me gusta escuchar música. I like to play games on my phone. Me gusta jugar juegos en mi teléfono. Watch an instructional video on using the phrase me gusta. Watch the video where the kids discuss what foods and drinks they like and don't like. A: ¿Cómo está la pizza? B: Me gusta. ¿Y tu taco? A: No me gusta mucho. A: Me gustan más los tacos de Chipotle. A: ¿Quieres probar mi refresco? Está bueno. B: No, gracias. No me gustan los refrescos. A: Te gusta más el agua. B: Sí, me gusta tomar agua. A: How is the pizza? B: I like it. And your taco? A: I don't like it much. A: I like Chipotle tacos more. B: Oh, yes, of course. A: Would you like to try my soda? It's good. B: No, thanks. I don't like sodas. A: You like water more. B: Yes, I like to drink water.